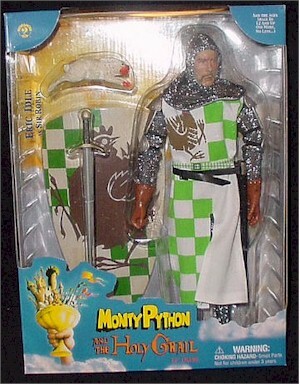 This review is a few weeks late, but Sideshow recently released their Monty Python “Holy Grail” 12 inch figures. They were a limited release of 10,000 figures (I don’t know if that means 2,000 of each of the characters, or 10,000 of each of them) and seem to be selling relatively well in my area. The characters are as follows: Graham Chapman as King Arthur, John Cleese as Sir Launcelot, Terry Jones as Sir Bedevere, Michael Palin as Sir Galahad, and Eric Idle as brave Sir Robin. 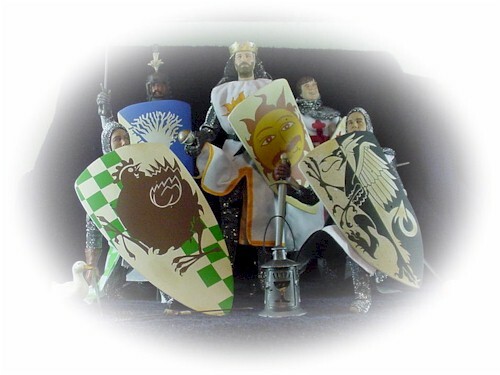 Like many others, I bought these figures as a sometime Monty Python fan and a fan of knights and swords in general. I will admit at the beginning of this review that I plan to watch the movie again and cannot comment with great detail on the accuracy of the costumes from my memory (but I shall do my best). I also view 2 out of 4 as an average score so my grades may seem a bit harsh at first blush. I will say that there were some odd surprises with these figures – both pleasant and unpleasant. Unlike the regular reviewer (Mr. Crawford – henceforth MWC) I really don’t care about the packaging. As long as the figure makes it to my house in one piece they could send it to me in a brown sack and give an extra accessory in place of it. That said, these boxes harken back to the earlier “non-flap” style boxes (the “Vampyre” figure for example). They have the one twist tie which drives MWC crazy and one of them even had the around the arms tie method which is a bit maddening (especially as tightly as these Knights chainmail fits). On the plus side the packaging does have various “Monty Pythonesque” sayings and warnings on it that made me chuckle. 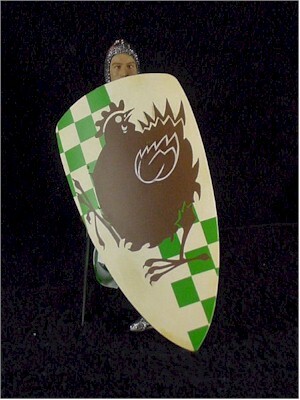 The hands sculpts are very nice, but difficult to force through the shield handles (the softness of the hands helps, but I can’t help but wonder how the paint will hold up over the course of several insertions/removals). 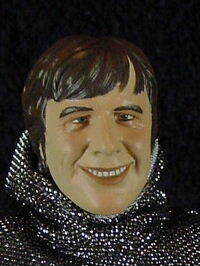 I think Sir Galahad is a bit puffy looking but all of the other likenesses are good. 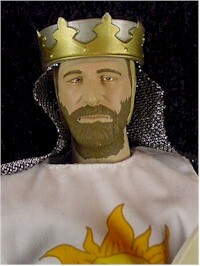 Unfortunately all of them except for King Arthur and Sir Galahad are also quite bald. 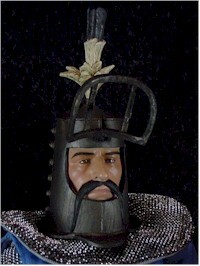 The King’s crown is also sculpted as part of his head, as is Sir Bedevere’s helmet -- this disappointed me quite a bit. I thought it would be either this category or the clothing category that would be the weak link on these toys, but I ended up being wrong! The paint applications are very well done but there are some other problems I found with mine. 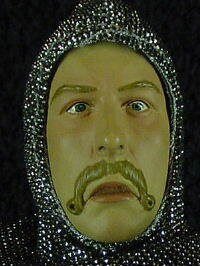 One of mine (Sir Launcelot) has a chipped nose. I don’t know what they could do to remedy this, but with this company going more toward mail order and online sales where the customer cannot pick out his own figures little problems like this become more important. Also they have the overall Sideshow sickly skin-tone that seems to appear on their normal human figures (compare them to other 1/6 companies figures and you’ll see what I mean). It works well on the monsters they do (and the old film characters like Fritz), but looks bad on figures like this and the Buffy figure. Unfortunately now that they have started this series of figures off with this grayish/sepia-ish skin tone they will need to continue with it to have the other figures fit in when displayed. My Galahad also seems to be quite cross-eyed (I have not seen others so I don’t know if this is a common problem, or if I just got “lucky”). There is also an overall sadness that seems to hang around these figures faces, I haven’t quite determined if it is in the sculpt, the painting, or a combination of the two. I thought that this would be the Achilles heel of these figures but was I wrong. There is some room for improvement in some areas, but the cloth chainmail – which I thought would look terrible -- proved to look fine. If you buy these planning on using them to make other Knights you may have some problems. The “mail shirts” which they wear have chest and back pieces that are of a silver fabric (non-metallic) unlike the rest of the patterned fabric. If you have plans to use these on other kitbashes prepare to cover their torso in some way to hide this. The mail fabric also fits fairly tight (which I think helps its appearance) and binds a bit in some poses, as it seems to be fairly unwilling to stretch. The slight binding doesn’t matter so much for posing as it does when it causes them to form “leg warmers” around their ankles if you don’t keep adjusting it upward (and one of mine came out of the box with this condition). The belts are acceptable but not really all that nice. 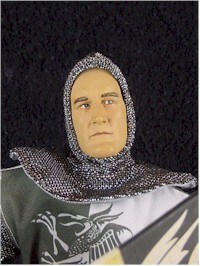 King Arthur should have brass colored mail on this head (I am pretty sure of this) and not silver like the others. In addition the mail bottoms end in “feetie pajama” feet that make standing the figures difficult. They have a build-up of seams that makes it nearly impossible to get the figure’s foot to meet a flat surface evenly. I don’t know what the answer there would have been. To make the foot wearing a slipper-type mail piece might have looked odd, but it would have added functionality. They have done a decent job of giving the different characters a different feel but I will always be disappointed in the lack of a removable helmet on Bedevere and the King’s crown being attached. Their armour consists of many generic pieces, but some touches to individualize them have been made (and to make them movie accurate). The clothing is nice. The problem isn’t so much with the quality of the accessories (with one exception) as with the lack of them. You get a sword (all the same except the King’s, but understandable with Knights of the Round Table), a shield, and one accessory with each character. The swords can be sheathed in their scabbards (and this works nicely). The shields are nicely weathered and Sir Robin’s is appropriately large. The other accessories are nicely sculpted (especially the Grail-shaped lantern with an opening door and a candle inside) except for the duck. The duck is nice, but he won’t stand up. I guess they figure you will be dunking him, but mine needs a small piece of cardboard under his one foot to get him to stand. I am not sure what would be good to use as additional accessories, but one more for each Knight would have been nice. I don’t know if it could have been a small dagger, but you just felt there should have been one or two more small items with these when you opened them up. Also (as I have previously whined about) the King’s crown and Bedevere’s helmet should have been removable and would have been the best accessories of all. 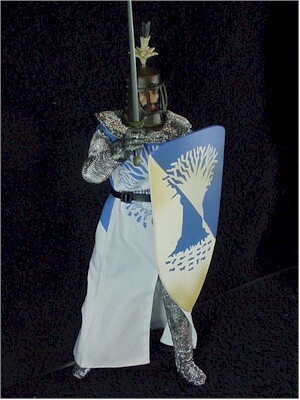 I do admit I am very fond of the swords and shields. This was the big surprise for me. They use the standard Sideshow body and I figured this category would be one not to worry about -- I was wrong. They are poseable, but won’t stand up! For some reason all of them have weirdly articulated ankles (except Sir Robin) and on top of the strange axis of articulation (side-to-side instead of up-down – see photo) mine have loose ankles. This greatly aggravates me. If you buy them plan on spending another couple of bucks for stands or driving yourself mad trying to keep them vertical. Also, I have a one-handed King Arthur now. I tried to put his shield on his left arm and the end of it came off (they are attached a little bit up the forearm). I am trying to tell myself this is just an isolated incident, but looking at the small nub of plastic which is supposed to keep the hand on doesn’t give me much confidence in how long my other Knights will remain two-fisted warriors. I guess I would rate this category as adequate, but clearly a surprise and a disappointment after the quality of the Fritz I recently bought. If you plan on moving these heads to other bodies you will lose the very nice and distinctive hands that have been molded as part of the body design. For figures of limited appeal I guess 25-30 is fair but they could have easily been the nicest things Sideshow has made if they had done a few things differently. Better (and more normal) ankles might have moved this up a half a notch and wrists that don’t have me worried would have easily moved them up a half a notch. Better wrists and ankles and one more accessory each and we would be getting close to perfect. Oh well, they are reasonably priced. Why a range? Well if the wrists hold-up long term I guess a 3, but if I have more problems with wrists then I could only give them a 2.5 (and depending on how many of them end-up with Carpal Tunnel maybe down to a 2). 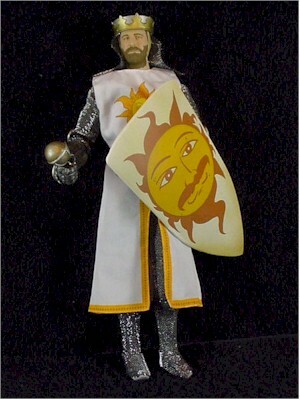 Part of the appeal of these figures is to get some 1:6 scale men in armor. 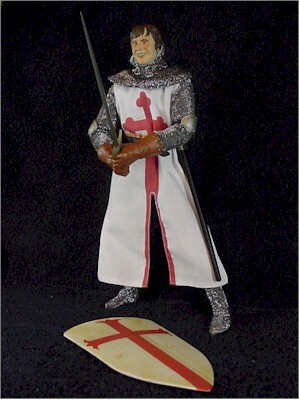 If Sideshow could do a little research and come out with a line of Knights from various time periods (and pirates would be cool too) I think they could get a nice little niche market. I know about half of the people I know who are buying these figures are only doing so secondarily because of their association with the movie. Maybe Sideshow could use the licensing money they would save to throw a few more weapons in and maybe some removable helmets. I do like these figures and they do make a nice display. I can only hope I can someday get more “men of stout heart and strong arm” to add to their numbers. I am also curious to see what others they make as they continue this line. They could have a real winner here with just a few minor fixes. I bought mine at Atlantic Toys, but most places on the web have them. Sideshow has them for $150 for the set, but most other places online have them for around $25 each and you can pick and choose which characters you buy. Many movie stores (Suncoast, etc) also have these if you want to look at them in person before you buy them. “Plastic Ape” is a toy, fish, and science nerd. He has worked at Renaissance festivals and various other silly jobs as he has accumulated toys and lost shelf space. Currently he collects 1/6 scale figures, Famous Covers (please, please, please make a Dr. Strange! ), BTAS/STAS, and Simpsons figures. He grades toys hard because he always tries to see the possibilities in a figure and gets disappointed by the fact that so often a toy falls short of perfection by such a small amount. 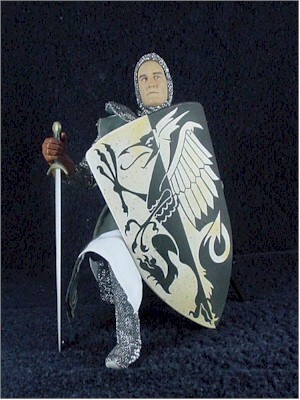 "The wise Sir Bedevere was the first to join King Arthur's knights, but other illustrious names were soon to follow: Sir Lancelot the Brave, Sir Gallahad the Pure, and Sir Robin the-not-quite-so-brave-as-Sir-Lancelot, who had nearly fought the Dragon of Angnor, who had nearly stood up to the vicious Chicken of Bristol, and who had personally wet himself at the Battle of Badon Hill, and the aptly named Sir Not-appearing-in-this-film." Figure from the collection of Plastic Ape.